The latest release of TransitQuote Pro transportation quote calculator includes a number of small but important improvements based on customer feedback. If your transportation or delivery business operates in a specific geographical area such as a city or district, you can now set up a radius from your center of business operations and prevent job requests for customers from outside of this area. We have always had a geographical restriction in place for the list of addresses that appear in the drop down addresspicker using Google’s “location biasing” which prioritizes nearby addresses over those far from your business area. This update will enforce the restriction so no addresses can be entered if they are outside of the radius you specify. Make sure you have a Business Location entered in the Map Options dashboard tab. Enter a radius in kilometers in the Search Radius option in the Map Options dashboard tab. After saving the settings page you will see a preview of the area on the settings page map so you can confirm the area is correct. We started using WooCommerce as a payment gateway at the beginning of this year and have had a lot of great feedback on the additional flexibility it provides. WooCommerce is an incredible ecommerce tool with many useful features other than just processing payments for your delivery company. WooCommerce includes a customer login feature, where customers can log in to view their orders and invoices. Until now TransitQuote was not compatible with the option to allow customers to log in on the checkout page. 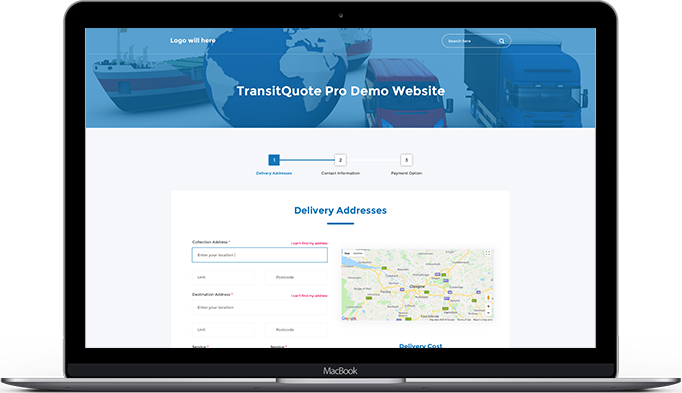 In TransitQuote Pro version 4.2.8 we have fixed this problem so if you use the customer account feature in WooCommerce you can give your customers the option to login as a returning customer on your website. If you have already purchased TranitQuote Pro you can download the latest version from a new download area on this website called My TransitQuote. Download area logins have been created for all customers with a monthly, annual or lifetime licence. If you have not yet received an email advising you of your login details, just go to the login page and click the “Lost your password?” link. Your username will be the email you entered when purchasing TransitQuote. In the download area you will find links to download the newest version of all products you have purchased and instructions on how to install the updates. If you need any help accessing your download area or with updating the plugin please contact us via our contact page.